ಕ್ಯಾರೆಟ್ ಹಲ್ವದಂತೆಯೆ ಬೀಟ್ ರೂಟ್ ಹಲ್ವ ಕೂಡ ಒಂದು ರುಚಿಯಾದ ಸಿಹಿ ತಿನಿಸು. ಮಕ್ಕಳಿಂದ ಹಿಡಿದು ದೊಡ್ಡವರೂ ಸವಿಯುವ ಈ ಸಿಹಿ ನೀವು ಮಾಡಿ ನೋಡಿ. Beet root halva is almost like carrot halwa with vibrant beet color and rich flavor. You should try this. Very tasty. Wash and peel the beet root and grate it using a grater or food processor. Cut the nuts into small pieces and keep it ready. Heat a TBSP ghee in a thick bottom pan on medium heat. Fry the cashews, almonds until it turns golden brown. Add raisins and fry it until it puffs up. Transfer this to a separate plate and to the same ghee add the grated beetroot. Fry it until the raw smell disappears. Mix it. Stir this in between and keep scraping the sides too. Once the milk is 3/4 evaporated add the ghee. Keep stirring and cook it on low flame until the mix becomes dry.The milk should evaporate completely and it becomes more like cooked beetroot with the khova. Now turn off the heat and add fried cashews, almonds and raisins. Mix it well. 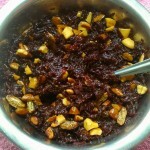 Now the beetroot halwa is ready to serve. You can store this halwa for a week in the refrigerator.Enjoy the halva hot or cold. My suggestion: use whole milk to get the authentic taste.